Delightful not only in its simplicity, 'Cheese & Crackers' is an extremely tasty example of the whole being greater than sum of its parts. 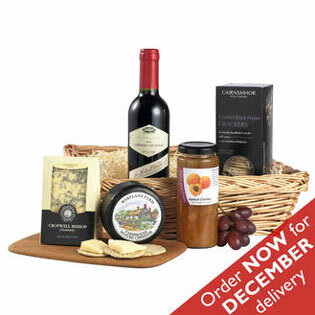 Each of the products in this woven wicker tray is individually excellent; Cropwell Bishop Stilton and Maryland Farm Mature Farmhouse Cheddar are both robustly flavoured cheeses, Cairnsmhor Cracked Black Pepper Crackers have real bite and the Apricot Chutney offers a sweetness which perfectly complements the savoury flavours of the cheeses. The Chilean Cabernet Sauvignon has a soft and well rounded palate, enriched with tasty spice. Together, the combination is unbeatable.